Successfully Added GPS Navigator "Navidos" - 5 Inch Touchscreen, 600MHz, Buid-in 4GB Storage, SiRF Atlas to your Shopping Cart. The Navidos is a handheld portable GPS navigation device which utilizes the lightning fast SiRF AtlasV chip, 4GB memory and the Windows CE 6.0 operating system for improved power and performance. The Navidos, along with its rich media enhanced operating environment, gives you the best user experience possible. The Navidos runs on the Windows CE6.0 operating system which is the premier OS choice for all the popular GPS devices. Load in your maps and experience amazing features like lane assist, voice guidance, 3-D views, intelligent route planning, along with dedicated night mode to make it easier on the eyes when driving. The Navidos has an excellent high resolution 800*480 screen and will guide you to your destination efficiently and accurately. You need this affordable GPS device to improve your car journeys; it is a fraction of the cost of its competition whilst providing the same functions. Even better, this GPS navigator comes with the powerful SiRF AtlasV chip, offering greater functionality, faster GPS fixes, and higher performance than ever before. This handheld GPS navigator features a stunning 5 inch touchscreen TFT LCD screen to bring all your videos to life! You can play multimedia files like MPEG, WMV, WAV, AVI, MP3 and MP4 saved in the internal 4GB memory or on external SD cards and USB thumb drives with a maximum of 32GB capacity with the Navidos. It even has an Adobe Flash player function, load up your flash files, and then play games or watch cartoons. You will benefit greatly from the advanced functions this GPS navigator has to offer at an unbeatable price. Not only is the Navidos an award-winning portable GPS device and multimedia powerhouse, it is also a remarkable eBook reader, gaming machine, and mass storage device! The FM transmitter allows you to simply pair your cars stereo with the Navidos and listen to the sound output from your GPS navigation unit directly on your cars own speakers. Use it as a handheld or mount it in-car with the free car kit. The Navidos also comes with a Car Charger, AC adapter, USB cable, Mounting Bracket and everything you need to use it straight from the box! It powers on instantly, comes with an incredibly responsive touchscreen and is compact enough to fit in your pocket! Be Smart - Add to Cart! Buy one for yourself and a couple more for your parents and relatives. Then stock up a bunch for your online store, brought to you by the online leader in direct from China wholesale electronics - Chinavasion. 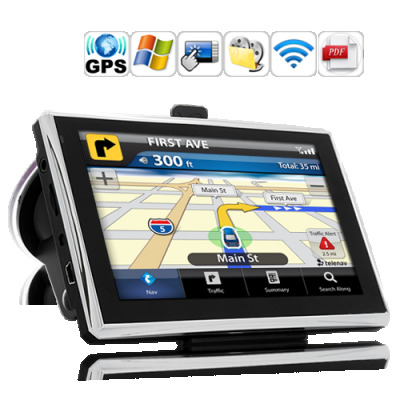 This model is compatible with most brands of GPS software, such as TomTom, iGO, Route66 etc. - however hardware specific software such as Garmin may not run on this unit. As the wholesaler, Chinavasion provides the GPS-enabled hardware only, not the software. Chinavasion provides no warranty or customer support regarding GPS software. Chinavasion cannot provide downloads / links / advice regarding GPS software. Any software installation you undertake should be performed or supervised by a professional. This GPS navigator does not come with any GPS software. You will need to buy a GPS Software that best suits your country. Can I adjust the volume of the music and the GPS software voice so as not to have one louder than the other? Yes you can, in the volume option within the GPS application; you can adjust the volume of both the music and GPS application voice. Does the GPS navigation also come with a rear view camera input lead? This GPS navigation does not come with a rear view camera lead. Copy the software and maps onto an SD card. Insert it into the SD card slot. Open the GPS Path, in the SD card directory; open the file folder to find the map to be use, select navigation software with the extension .exe. nagyon jo gps! konnyu es szep! 800*480 pixel képernyőfelbontás van! nekem 480*272 pixel képernyőfelbontás erkezett!